To drive into Houston from the east is to glimpse the beating heart of a petrochemical empire: south from I-10, fifty miles of facilities ring the Houston Ship Channel and the Galveston Bay below. Up close, the complex gives the photonegative feeling of beholding the ocean, or a mountain range. Drums holding millions of chemical gallons sigh eternally into the balmy air. Skeletal smokestacks belch streams of fire like the Olympic torch. You might expect to find the Terminator retired there. 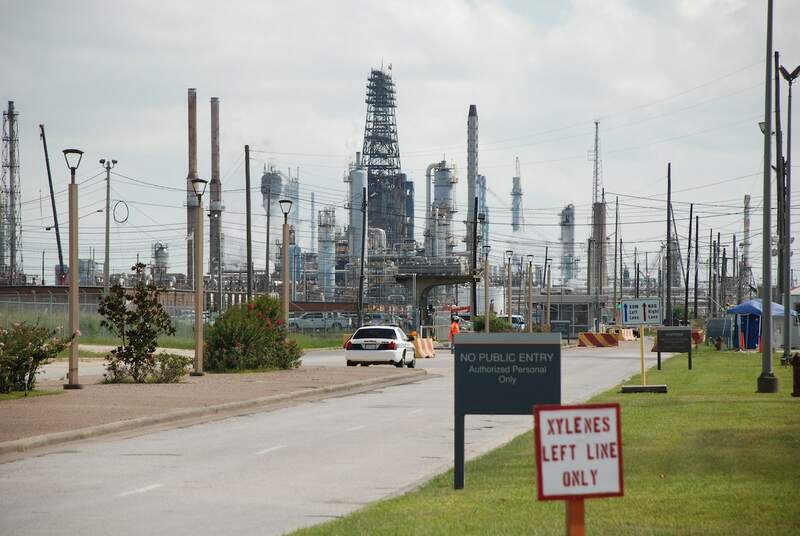 Harvey offered a miniature preview of what might happen, when an Arkema chemical processing plant flooded in Crosby, northwest of Houston, and a tank of organic peroxides exploded, sending a black plume skyward. First responders arrived unprepared, and, according a lawsuit filed after the storm, “one by one, the police officers and first responders began to fall ill in the middle of the road,” vomiting and choking. The dreaded storm surge would magnify that risk a thousand-fold—petrochemical drums would be lifted off the ground by the water, allowing their contents to slip into floodwaters and poison those unlucky enough to live nearby. Houston would be under double threat. “People are going to die because of the floodwater,” Blackburn says, as they did in Harvey, “not to mention the oil and hazardous substances.” As the waters receded, they would destroy one of the most prolific estuaries in the country—both in commercial and biodiverse terms—and choke out the wildlife in the bay itself. Yet, curiously, the companies lining the Channel have shown little urgency in protecting their plants. The plan to build an “Ike Dike” has been discussed since Hurricane Ike hit in 2008, and while that talk has again heated up in Harvey’s wake, there has been little movement as yet. Greater Houston processes two of every five barrels of petroleum in the U.S., and half of American jet fuel. Major damage to the facilities in the channel would cast a pall on the national economy. In Houston, some folks are starting to think about what might happen when the oil and gas industry fades. While the city’s economy has diversified in recent years, economists still attribute around 45 percent of its economic activity to the industry—down from nearly double that number in 1980. In Houston, some folks are starting to think about what might happen when the oil and gas industry fades. Texas already is the nation’s largest producer of wind energy, at three times more than second-place Iowa in absolute terms. North Texas houses the nation’s second and third largest online wind farms. As the New York Times reported last year, renewable fuel sources are quietly becoming more economically viable, with red states putting the technologies most heavily to use. In 2010, NRG, an energy giant headquartered in Houston, bought Green Mountain Energy, at the time the nation’s largest provider of renewable energy, wagering that more customers were shading green. Environmental justice advocate Yvette Arellano and her exhaustive catalogue of petrochemical spills. The transition to renewable energy, so far as it goes, will take time, and in the interim there is much to be done. Rice University soil scientist Carrie Masiello breaks down the climate change puzzle into a few broad categories. Outside the classroom, she is still teaching, charting invisible diagrams across her desk with her hands as she considers the science. Renewables help to prevent the release of new CO2—a prime contributor to global warming—into the atmosphere. Another piece of the puzzle, though, is how to get the CO2 already in the atmosphere out. The latter process is referred to as carbon sequestration—taking atmospheric carbon dioxide and storing it inertly in the ground. This can either be done in deep carbon wells through industrial processes, themselves energy-intensive, or through surface sequestration, which occurs within a few feet of the atmosphere. The Houston area has already begun sequestering carbon. NRG has put an experimental scrubber into its coal-fired Petra Nova plant. The scrubber captures 10% of the plant’s carbon dioxide and pumps it 90 miles away into flagging oil wells, boosting their productivity. The economic viability of the technology depends on the price of the additional oil produced, but finding a way to make such technologies affordable could mean their dissemination to coal plants worldwide. Still, the project carries a whiff of farce, as it uses captured carbon to pump extra carbon-emitting fossil fuels that might otherwise remain in the ground. But Houston also has an enormous surface-level carbon sink: its prairies. The last piece in this series examined how prairies could aid in the battle to stop flooding, by enhancing the land’s absorption of rainwater. The same deep roots that allow the prairies to sponge water up also allow the tall grasses to absorb atmospheric carbon. Grasses, unlike trees, put half of their biomass underground in extensive root systems. Masiello explains that this half-hidden pattern evolved as part of a “long-term evolutionary arms race between grasses and grazers,” to protect the plants when grazers eat their heads. The deep root structures allow the grasses to “pump carbon down” into the ground, where it is stored both in the roots themselves and in the soil. The last piece in this series examined how prairies could aid in the battle to stop flooding, by enhancing the land’s absorption of rainwater. The same deep roots that allow the prairies to sponge water up also allow the tall grasses to absorb atmospheric carbon. Unlike other carbon-offset programs, which often balance emissions by investing in more efficient technology, the TCE aims to directly remove carbon from the air. Its scope is local, and the prairies, proponents point out, are broadly useful besides. Ranchers and landowners with dwindling yields outside of Houston could make their land economically viable without selling to developers, by selling off the carbon rights and grazing cattle on their lands—not to mention the potential for ecotourism and hunting. The grasses, especially west of Houston and along the coast, would help ameliorate flooding and preclude subdivisions in flood-prone land. That purchasing power goes both for the ultimate consumers of goods being produced, and for investors. Blackburn points to the University of California pension fund’s 2015 divestment from oil sands (along with coal), “because they’re concerned that it’s not a good financial investment.” Currently, the Massachusetts and New York district attorneys are suing ExxonMobil for misleading investors into undue optimism by suppressing unfavorable climate science. Strong governmental action on climate change might mean that oil companies’ assets get stranded, if they are forced to leave fossil fuels in the ground. With that in mind, ExxonMobil decided in December to disclose its analyses of the risks that climate action poses to its business, after shareholders voted for greater transparency. “I think we have spent more time in Houston trying to accommodate homes for those who are yet to come, for those we want to attract here, rather than protecting the people we already have here,” he says. Arellano, the environmental justice advocate with a yet more immediate mandate, would surely agree. Houstonians are a people of the prairie, but in the megalopolis it can be easy to forget. With so many newcomers—greater Houston added 159,000 residents in 2016 alone—it can be hard to feel tied to the flora-filled past. “We conceive of the work that we do as reintegration,” Gonzalez explains. “Trying to reintegrate nature into community, trying to reintegrate literally the fabric of living things with the built environment”—rootedness through roots. The Texas Coastal Exchange integrates the local carbon cycle by linking emissions with the idea that, in a balanced system, they need some place to go. While the Exchange could reduce atmospheric carbon levels, even Blackburn’s most optimistic estimates bite out only a tiny chunk of the earth’s excess, a number increasing by the year. The greatest utility of the Texas Coastal Exchange may be that it helps Houston “get to work.” Right now, even as oil and gas companies make their advertising greener, the federal and Texas governments are undercutting climate research and slashing regulations. Texan legislators can sneak climate change into public discussion by talking about “weird weather,” but the attention paid is oblique at best. But if corporate interests in Houston were able to address climate change in a way that allowed them to take action, the conversation could become more robust. “The Texas Coastal Exchange is one of those projects that interjects a strong ray of optimism into this whole situation,” Blackburn says. “With both climate change and the future of the Texas coast, and potentially the future of the United States relative to the climate.” Soil carbon monitoring, the first step in establishing the Coastal Exchange, will begin sometime this year.